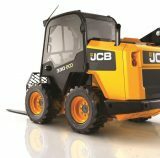 The most well know brand in materials handling. RVT can supply you the right machine to suit every need on the farm –Telehandlers, Loading Shovels, Skid Steer Robots, Fastrac’s, Compact Excavators. plus a wide range of attachments. JCB has been producing farm machinery since 1945, when Joseph Cyril Bamford built his first farm trailer. They’ve always understood that, when it comes to agricultural machinery, only the very greatest levels of performance and productivity will do. 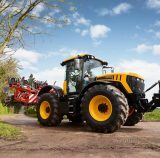 That’s why they’ve always believed in developing specialised farm machinery; agricultural Loadalls were introduced in 1977, agricultural wheeled loaders in 1983, and Fastrac tractors in 1991. They’ve also always believed in using innovation and technology to make their agricultural equipment as efficient as possible. In 2006 they introduced TorqueLock to reduce fuel consumption and increase top speeds. In 2010 they patented Adaptive Load Control to improve safety and stability on their telescopic machines and introduced LiveLink, a telematics system. 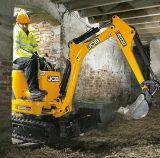 The award-winning JCB EcoMAX engine range came into full production in 2012 -This clever and efficient motor burns its fuel so cleanly that it doesn’t require any bulky or high-maintenance exhaust after-treatment in order to meet Tier 4i/Stage IIIB legislation. 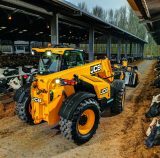 In 2016 JCB released the new JCB AGRI Pro, an unrivalled innovation which provides the best of both hydrostatic and powershift gearbox technology. AGRI Pro offers the fine control and inching capabilities associated with hydrostatic drive, together with the high road speeds and greater acceleration you’d expect from powershift. 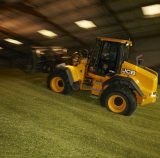 JCB are not stopping there with their farm machinery either; they’ll carry on developing new solutions, improving and expanding the range to meet our customers’ future needs and expectations.